Have you seen Monogram’s new ads? Here’s one of the new Monogram ads – take a look! We’re traveling on a cross-country modern design road trip with Dwell in a prefabricated house, custom-built and outfitted with Monogram appliances. Our first destination in April was Portland, Oregon; in May we visited Dwell on Design in Los Angeles, California; in June we visited the Phoenix, Arizona metro area; we traveled to Austin, Texas, in July; last month we visited Dallas, Texas; and this weekend we will be in Boston, Massachusetts! We will be popping up at The Innovation and Design Building September 11th – 12th during the American Field Exhibition and Market. On Friday September 11th, the home will host a series of Continuing Education Units (CEUs). Check out the details and sign up here! On Saturday, September 12th, the doors will be open to the public. Plus! 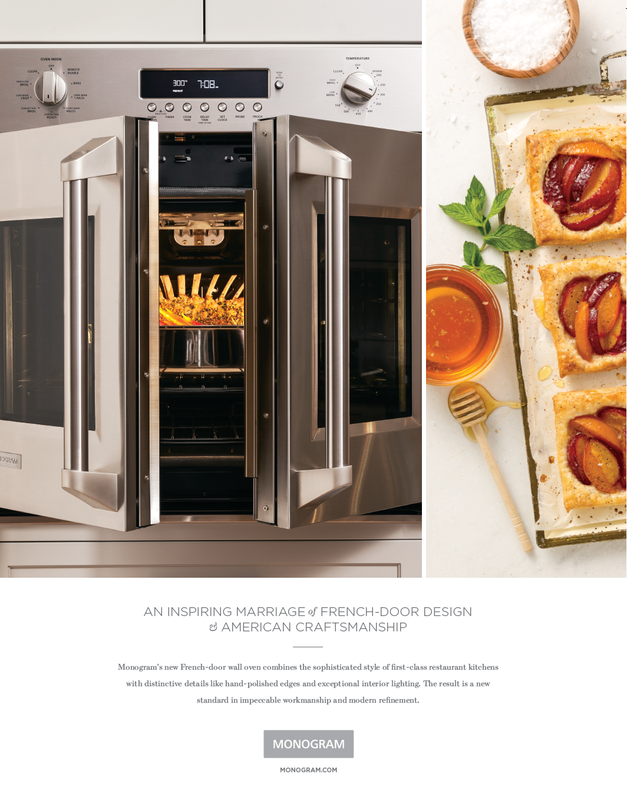 When you stop by, you will have the chance to enter to win a Monogram appliance. A full schedule of events is listed here. 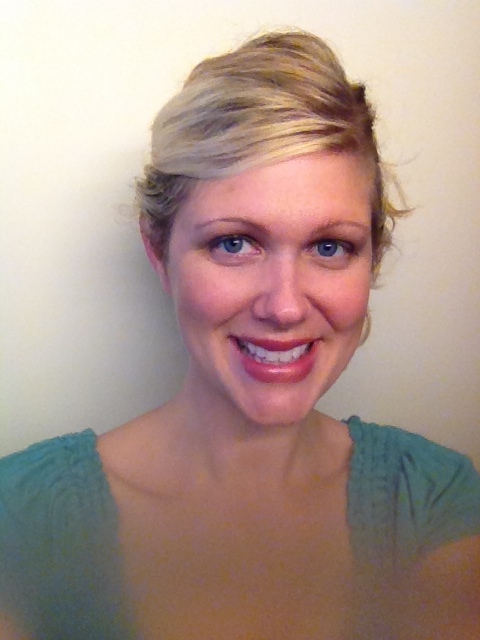 Today’s profile highlights Sarah Robinson with Jansen Inc. in Pensacola, Florida. Sarah: I became interested in design many years ago. I used to watch This Old House with my dad when I was a kid and was just fascinated by the older homes. Sarah: The thin linear glass tiles and the small square glass tiles for a backsplash in a kitchen. 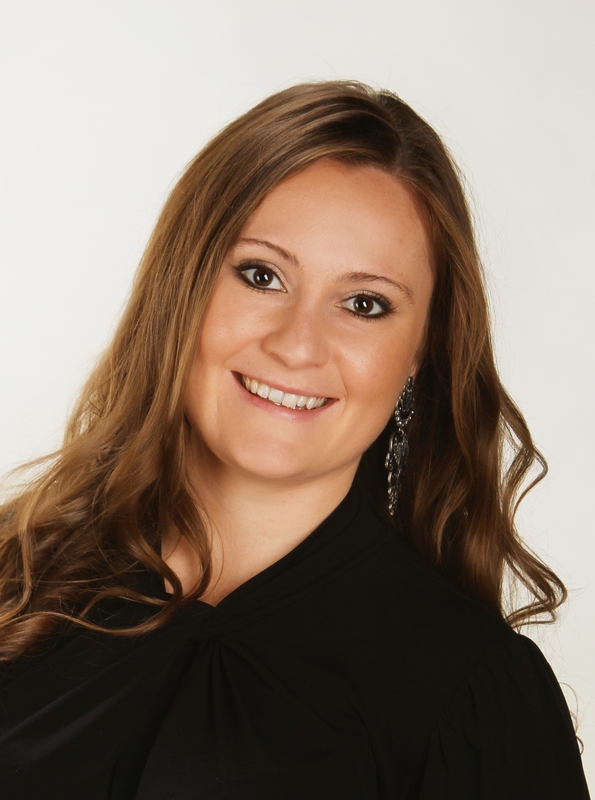 Today’s profile highlights Melissa Helvey with Great Floors in Spokane, Washington. Melissa: Throughout my childhood I had always said I wanted to be a lawyer when I grew up. My senior year in high school I took an interior design class, just to fill my required course load. The first day of class we visited a home construction site, and the minute I stepped in and looked around at the framing and everything coming together. I knew instantly that was what I was meant to do. Melissa: I recently finished a kitchen remodel. My client found me at a Home Show back in April and she came up to me with a sketch on a napkin of her kitchen and said.. I NEED YOU … She had a dreadful existing kitchen that was so small and materials so dark it was like being in a cave. WE worked closely to find a design and materials that would make the space feel more comfortable to be in and more functional. Throughout the project she would send me photos almost daily, so excited about the progress. At the end of the project she called me in tears. I said, Mary, what’s the matter? Are you not happy with your kitchen? She said, “I LOVE it! I can’t tell you how much I love it and how much I appreciate all your help.” It wasn’t an award-winning design or even very creative, but this really captures why I do what I do. I love being able to help people have a better life. Help them through what can be a very difficult process and experience their joy at the end. Melissa: I still love the greys. I know it’s been trending for quite a while, but in my neck of the woods were pretty slow to catch on to the trends. Melissa: I was so impressed with how much research and thought goes into the Monogram product line. It was so amazing to see the 3D printing technology and learn how it has improved and sped up the research process. I wasn’t familiar with all the capabilities of the Avantium technology. I called my husband back at home the day we learned about it and told him we were getting one! We’re traveling on a cross-country modern design road trip with Dwell in a prefabricated house, custom-built and outfitted with Monogram appliances. Our first destination in April was Portland, Oregon; in May we visited Dwell on Design in Los Angeles, California; in June we visited the Phoenix, Arizona metro area; we traveled to Austin, Texas, last month; and this weekend we will be in Dallas, Texas! 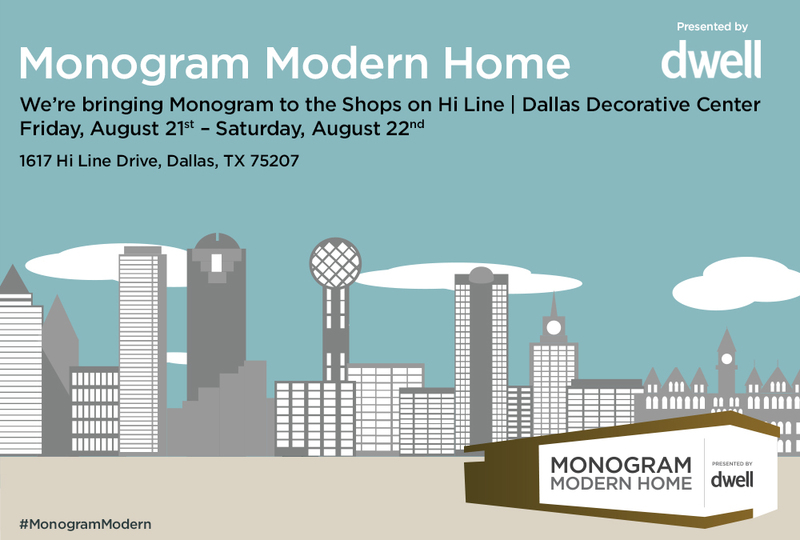 We will be popping up at the Shops on Hi Line | Dallas Decorative Center on August 21st and 22nd. On Friday, August 21st, the home will host a series of Continuing Education Units (CEUs). Check out the details and sign up here! On Saturday, August 22nd, the doors will be open to the public. Plus, when you stop by, you will have the chance to enter to win a Monogram appliance. A full schedule of events is listed here. Sign up for CEUs, join us at the open house and follow us on social media for surprise – yet to be announced – events and giveaways. We’re traveling on a cross-country modern design road trip with Dwell in a prefabricated house, custom-built and outfitted with Monogram appliances. Our first destination in April was Portland, Oregon; in May we visited Dwell on Design in Los Angeles, California; in June we visited the Phoenix, Arizona metro area; and this weekend we will be in Austin, Texas! 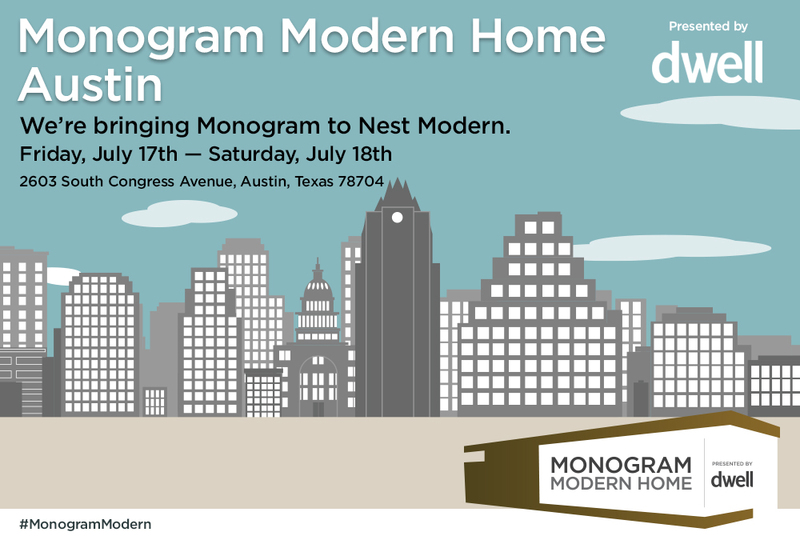 We will be popping up at Nest Modern July 17th and 18th. On Friday, July 17th, the home will host a series of Continuing Education Units (CEUs). Check out the details and sign up here! On Saturday, July 18th, the doors will be open to the public. Plus, when you stop by, you will have the chance to enter to win a Monogram appliance. A full schedule of events is listed here. Sign up for CEUs, join us at the open house and follow us on social media for surprise – yet to be announced – events and giveaways. We’re traveling on a cross-country modern design road trip with Dwell in a prefabricated house, custom-built and outfitted with Monogram appliances. Our first destination in April was Portland, Oregon; in May we visited Dwell on Design in Los Angeles, Califormia; and this weekend we will be in the Phoenix, Arizona metro area! We will be popping up at the Scottsdale Museum of Contemporary Art at the Civic Center Mall June 26th and 27th during the MetaModern exhibition, featuring modernist design objects of the mid-century. On Friday, June 26th, the home will host a series of Continuing Education Units (CEUs). Check out the details and sign up here! 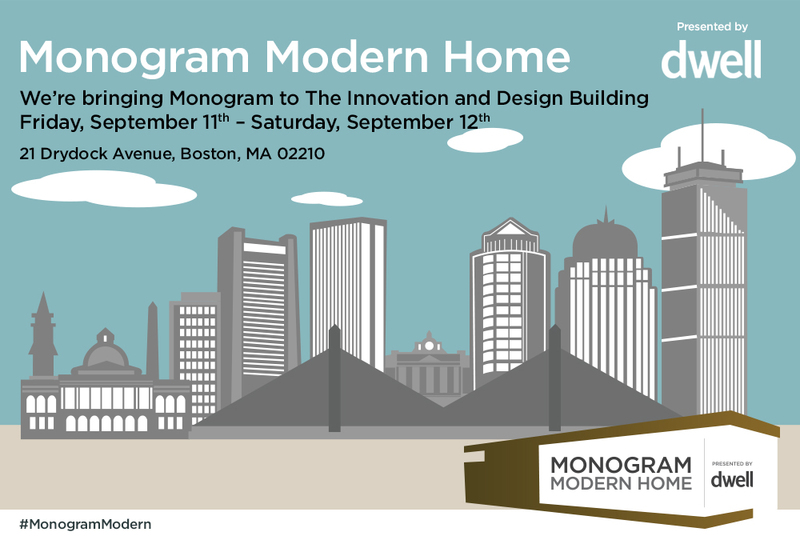 On Saturday, June 27th, the doors of the Monogram Modern Home will be open to the public. 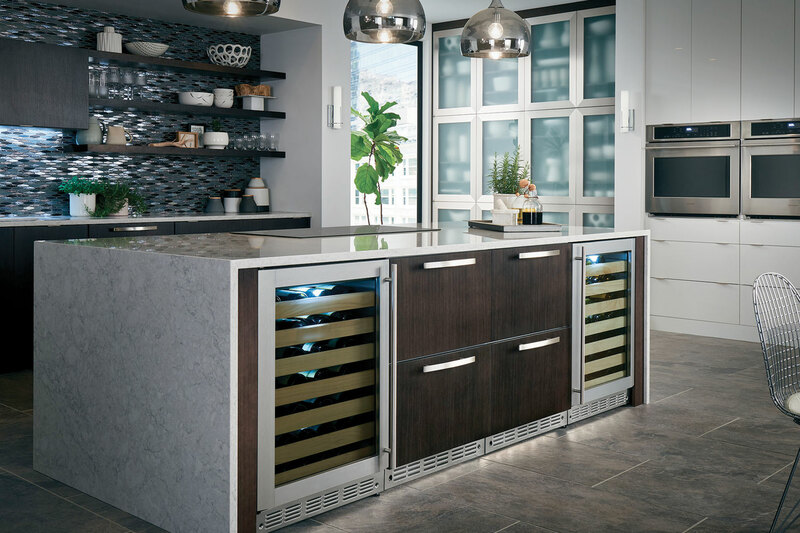 When you stop by, you will have the chance to enter to win a Monogram appliance. A full schedule of events is listed here. Sign up for CEUs, join us at the open house and follow us on social media for surprise events and giveaways.